The phenomenon of tectonic movements is the best recognized in the history of basin development. Therefore, landscape analyses of such areas and studies of drainage networks, in particular, provide insights into current tectonic processes and their activities. Attempts to quantify tectonic deformation from landscape analyses have been performed for decades (e.g., Bull and McFadden 1977; Rockwell et al. 1985; Merritts and Vincent 1989; Burbank 1992; Burbank and Anderson 2001; Keller and Pinter 2002; Crosby and Sheehan 2006; Wobus et al. 2010, 2012; Kirby and Whipple 2012). 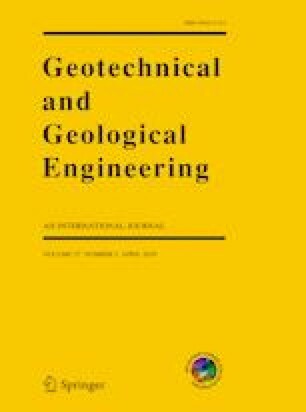 The rapid development of GIS techniques and the constant advancement in digital elevation model (DEM) quality and access provide significant and efficient tools to compute, calculate and analyze geomorphic indices across areas of various environments and scales (e.g., Keller et al. 1982; Ramírez-Herrera 1998; Kirby et al. 2003; Gürbüz and Gürer 2008; Arrowsmith and Zielke 2009; Gasparini and Whipple 2014). However, studies that use geomorphic indices to explore the relative activity of tectonic processes in the fore-arc regions of active subduction zones are limited and/or use only one or two indices (e.g., Wells et al. 1988; Fisher et al. 1998; Morell et al. 2008; Rehak et al. 2008). Active deformation in the Zagros Mountains is caused by the northward motion of the Arabian Plate with respect to Eurasian Plate, which occurs at a rate of 25 mm year −1 at longitude 56°E (Ramsey et al. 2008). The style of deformation appears to vary along the strike of the Zagros Mountain Range. In the NW (Dezful), N–S shortening between Arabia and Eurasia plates is accommodated on a spatially separated system of NW trending right-lateral strike–slip and thrust faults (Ramsey et al. 2008). 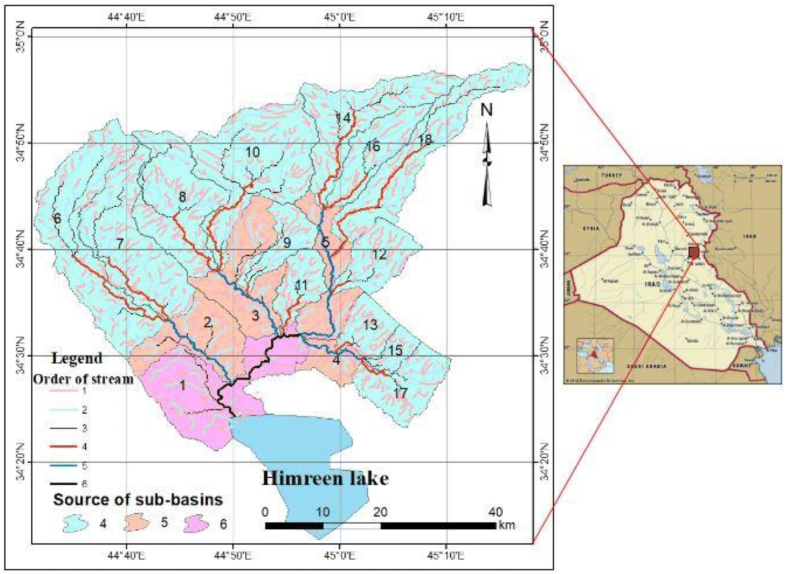 It is worth to mention that Dezful Embayment in Iraq is called Kirkuk Embayment (Fouad 2012). Recent works have been carried out on the tectonic activity; among them are Verrios et al. (2004), they performed their study in Greece. El-Hamdouni et al. (2008) performed their study in South of Spain. In Iran many studies were performed, Ghassemi (2005) has commented on the fold growth in NE Alborz, Dehbozorgi et al. (2010) in central Zagros Range, Mumipour and Najad (2011) in south of Iran, Toudeshki and Arian (2011) in northwest Iran, Habibi and Gharibreza (2015) in central part of Iran, and Mosavi and Arian (2015) in northeast of Iran. All those studies have used the geomorphological indices to indicate the tectonic activity in their studied areas. 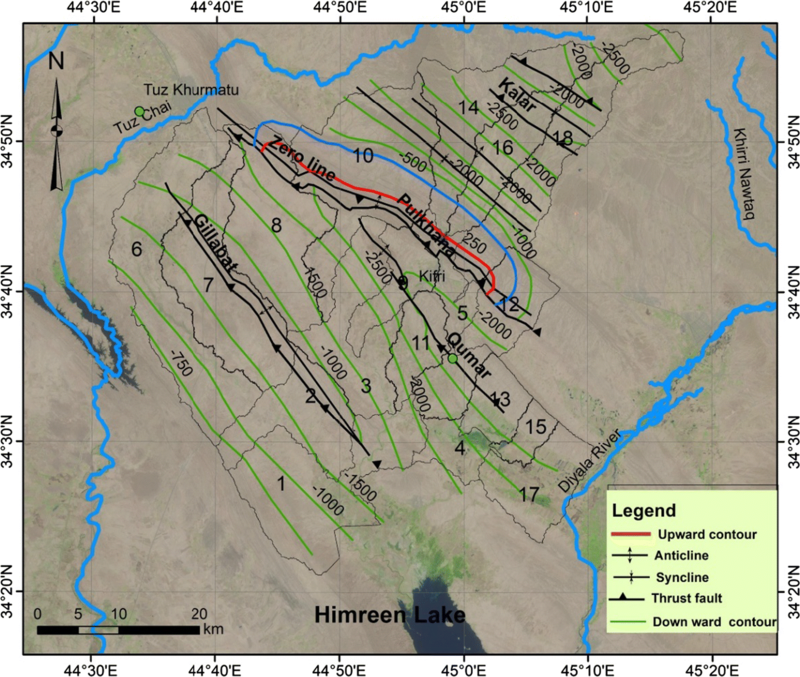 The above mentioned review for a part of the existing literature indicates that the knowledge about the effects of tectonic movements upon river valley forms; fluvial processes are not sufficiently investigated in the Iraqi territory where these issues are very rarely studied and require more detailed studies. Kfiri Chai Basin is located in the north-eastern part of Iraq (Fig. 1). The coverage area is 2821.15 km2. 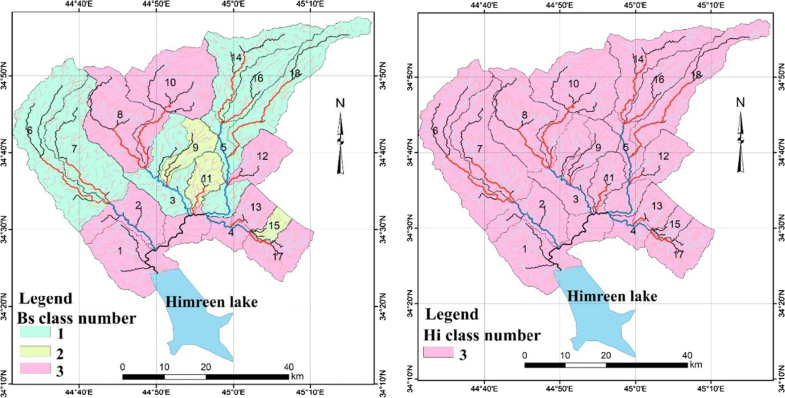 The Kifri Chai Basin was divided into eighteen sub-basins and called them in this study as Sub-basins No. 1 to No. 18. The main aim of the current study is to indicate the tectonic activity of Kifri Chai Basin which is part of the Western Zagros Range. 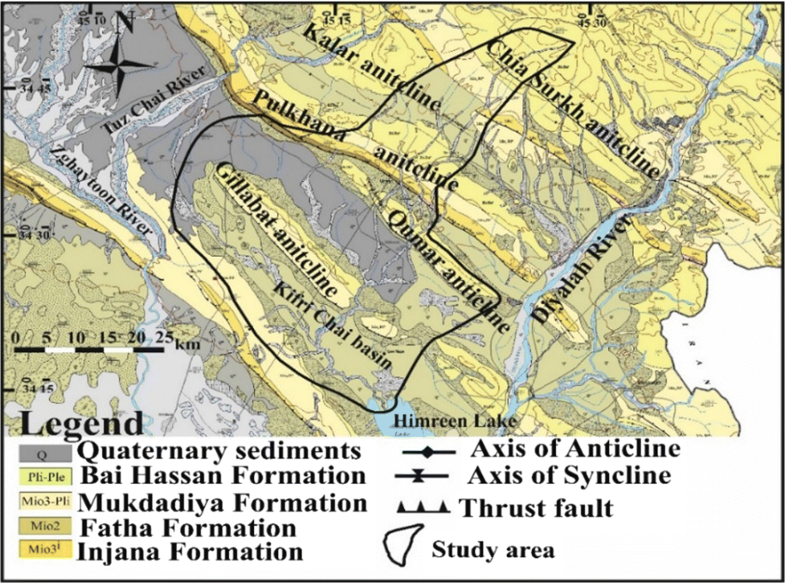 Moreover, the relative tectonic activity was compared with the regional Neotectonic movements in Kifri Chai Basin to indicate the relation between both aspects. The studied area is located within the Low Folded Zone of the Outer Platform, which belongs to the Arabian Plate (Fouad 2012). Four anticlines occur in the study area; these are from the north to south: Kalar, Pulkhana, Qumar and Gillabat (Fig. 2). All the anticlines exhibit thrusting, where their northeastern limbs are thrusted over their southwestern limbs causing their disappearance and the anticlinal axis (Sissakian 1978; Youkhanna and Hradecky 1978). The youngest exposed formation is the Bai Hassan Formation. This means that the thrusting had occurred after the Middle Pleistocene; accordingly, it is considered as a neotectonic movement (Obruchev 1948). Fatha Formation (Middle Miocene): Consists mainly of reddish brown claystone, marl, limestone and gypsum and cyclic nature. Injana Formation (Upper Miocene): Consists mainly of reddish brown sandsotone, siltstone and claystone in cyclic nature. Mukdadiya Formation (Upper Miocene–Pliocene): Consists of greyish sandsotone, siltstone and claystone in cyclic nature. With some pebbly sandstone. Bai Hassan Formation (Pliocene–Pleistocene): Consists mainly of conglomerate, reddish brown claystone in cyclic nature, with some sandstone beds. The neotectonic activity in Iraq is considered since the Upper Miocene, when the marine environment was terminated and continental depositional environment prevailed. This assumption is based on Obruchev (1948) and Atomenergoexport (1985). Sissakian and Deikran (1998) compiled the Neotectonic Map of Iraq, which is based on the contact between the Fatha Formation (Middle Miocene) and the Injana Formation (Upper Miocene) as compared to the present topography. This study was carried out using Radar Topography Mission (SRTM) data with extensive use of previously published geological, and Neotectonic maps. 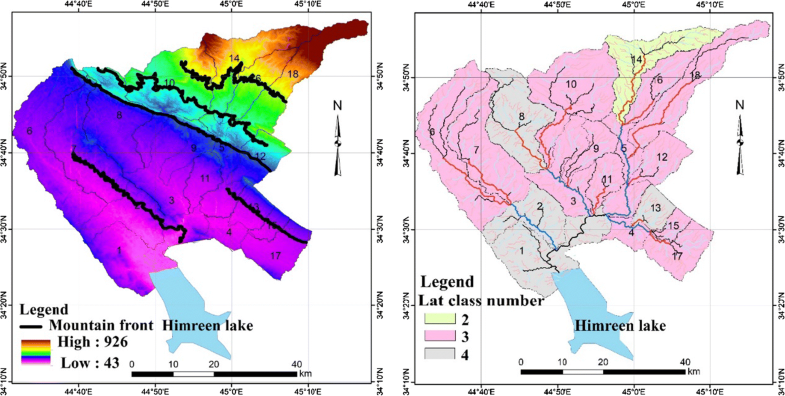 The borders of the sub- basins were delineated using SRTM image that has a ground resolution of 3-arc-second (90 m) and a vertical resolution of approximately 10 m.
Kifri Chai Basin was divided into eighteen sub-basins according to the ordering of the streams, using Straller’s stream ordering method. The stream order was generated up to 6th orders using the stream ordering module of ArcGIS. The eighteen sub-basins are located depending on the 4th, 5th, and 6th stream orders. The coverage area of the basin was extracted from the DEM map using the basin extraction tool of ArcGIS which gives accurate size and shape of each sub basin. 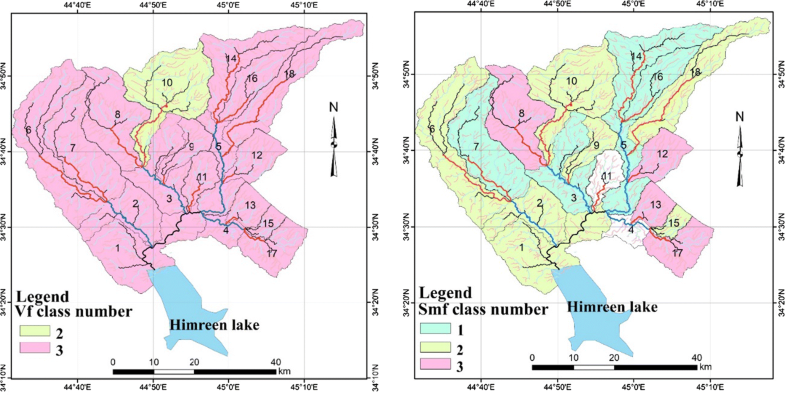 Six geomorphic indices were used to estimate the relative tectonic activity in Kifri Chai Basin. For each index, a map was constructed based on DEM image which shows the classes of each index at each sub-basin. The measured six geomorphic indices at each sub-basin are mentioned hereinafter. The acquired values (Table 1) and classes are according to El-Hamdouni et al. (2008) and enclosed references. where SL denotes the Stream length gradient index, ∆H/∆L denotes the channel slope or gradient of the reach (∆H is the change in elevation of the reach and ∆L is the length of the reach), and L denotes the total channel length from the point of interest (Hack 1973). The values of the Sl in the eighteen sub-basins are assigned in Table 1. The (Sl) Index is classified into three tectonic activity classes: (Class 1) High (Sl > 500), (Class 2) Moderate (300 ≥ Sl < 500), and (Class 3) Low (Sl < 300). The acquired average Sl value is 309.8 which indicates Class 2, meaning Moderate tectonic activity, the classes of the eighteen sub-basins are shown in Fig. 3.
where Ar represents the area on the right side of the trunk stream, and At represents the total area of the drainage basin. The values of the Af in the eighteen sub-basins are assigned in Table 1. The Asymmetric Factor (Af) is classified into three classes: (Class 1) (Af < 35 or Af > 65), (Class 2) (57 < Af < 65 or 35 < Af < 43), and (Class 3) (43 < Af < 57). 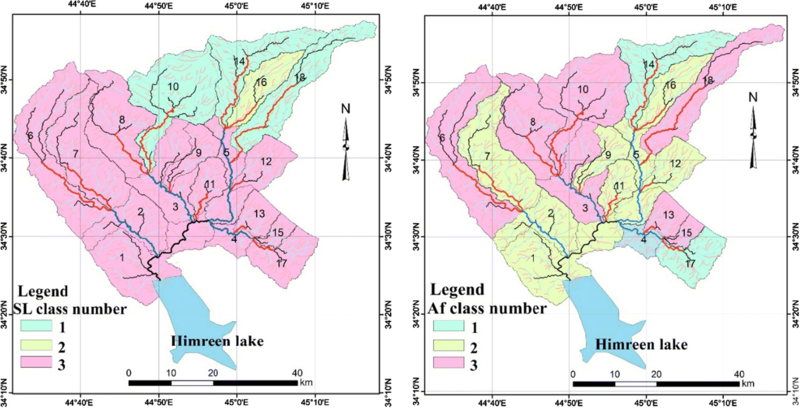 The average Af value is 47.7 which indicates Class 3, and the classes of the eighteen sub-basins are shown in Fig. 3.
where Bl is the length of a basin measured from the headwaters point to the mouth of the sub basin, and Bw is the width of sub basin measured at its widest point. The basin shape index (Bs) includes three classes: (Class 1) Elongate basin with Bs > 4; (Class 2) Semi-elongate basin with 3 ≤ Bs < 4; and (Class 3) Circular basin with Bs < 3. The values of the Bs in the eighteen sub-basins are assigned in Table 1. The average Bs value is 4.56 which indicates Class 1. The classes of the eighteen sub-basins are shown in Fig. 4. The Hypsometric Integral index (Hi) is classified into three classes: (Class 1) (Hi ≥ 0.5), (Class 2) (0.4 ≤ Hi < 0.5) and (Class 3) (Hi < 0.4). (Table 1). The values of the Hi in the eighteen sub-basins are assigned in Table 1. The average Hi value is 0.18, which indicates Class 3. The classes of the eighteen sub-basins are shown in Fig. 4.
where Vf denotes the valley floor width to valley height ratio, Vfw denotes the width of the valley floor, Eld and Erd stand for elevations of the left and right valley divides, respectively Esc denotes the elevation of the valley floor (Keller and Pinter 2002; Cuong and Zuchiewicz 2001). The Vf index is divided into three classes: (Class 1) (Vf≤ 0.5), (Class 2) (0.5 ≤ Vf < 1.0) and (Class 3) (Vf≥ 1). The valleys are often narrow upstream from the mountain front (Ramírez-Herrera 1998). The indicated values of Vf are assigned in Table 1. The acquired average Vf value is 6.55 which indicates Class 3. The classes of the eighteen sub-basins are shown in Fig. 5. The index reflects the balance between erosion forces that tend to cut embayment into a mountain front and tectonic forces that tend to produce a straight mountain front (Verrios et al. 2004). where Smf denotes the mountain front sinuosity; Lmf denotes the length of the mountain front along the foot of the mountain at the pronounced break in slope, and Ls denotes the straight-line length of the mountain front. The values of the J in the eighteen sub-basins are assigned in Table 1 and the classes are presented in Fig. 5. The measured mountain-fronts are shown in Fig. 6. The Mountain Front Sinuosity Index (J) is divided into three classes: (Class 1) High, J = 1.0 to 1.5, (Class 2) Moderate, J = 1.5 to 2.5, and (Class 3) Low, J > 2.5 (El-Hamdouni et al. 2008). The acquired average Smf value is 1.8 which indicates Class 2.
where S represents the sum of previous indices, N represents the number of selected indices. The values of the Iat index are divided into four classes (El-Hamdouni et al. 2008) to define the degree of active tectonics: Class 1—Very high (1.0 ≤ Iat < 1.5), Class 2—High (1.5 ≤ Iat < 2.0), Class 3—Moderate (2.0 ≤ Iat < 2.5), and Class 4—Low (Iat > 2.5). The Iat values in the eighteen sub-basins range from 2.00 to 2.66 and the average Iat value is 2.35 (Table 2), which indicates Class 3; meaning Moderate tectonic activity. The Iat classes of the eighteen sub-basins are presented in Fig. 6. The amounts and rates of the subsidence and/or upward movements, during the Neotectonic Period, and the Iat values and tectonic activity class in each of the eighteen sub-basins are assigned in Table 3. Moreover, the subsidence and upwards amounts were calculated during the Pleistocene (2.8 Ma) and the Holocene (11.7 Ka) (ICS 2012) in the eighteen sub-basins (Table 3). The amount of the subsidence during the Neotectonic period, Pleistocene and Holocene range from (0–3000), (0–23. 28) to (0–2.93) m, respectively. Whereas the amount of the upward movement during the three intervals range (0–250), (0–1.94) and (0–0.24) m, respectively. The subsidence and upward rates during the Neotectonic period range (0–2.5) and (0–0.21) cm/100 year, respectively. Those sub-basins which exhibit wide range of subsidence, the Iat values indicate High tectonic activity (Sub-basin No. 14) or Medium tectonic activity, but with Iat value of 2.16 which is very close to Class 2 (for example Sub-basin No. 18). The subsidence amount depends on the thickness of the exposed formations younger than the Fatha Formation which forms the beginning of the Neotectonic phase in Iraq. The thicknesses of the Injana, Mukdadiya and Bai Hassan formations which overlie the Fatha Formation are considered in the construction of the Neotectonic map of Iraq (Sissakian and Deikran 1998). The thicknesses are highly variable in the area; therefore, any miss-estimation of the thicknesses will give subsidence wrong amount of subsidence. This may be the case with Sub-basin No. 4. The acquired data of the six studied geomorphic indices showed that the average Iat value in Kifri Chai Basin is 2.35, which means Class 3; meaning that the Relative Tectonic Activity in the basin is Moderate (Table 2). Moreover, the regional Neotectonic activity data showed that there is positive relation with the relative tectonic activity in Kifri Chai Basin. The tectonic activity and the values of each of the six geomorphic indices are discussed showing the main differences and the reasons for similarities and/or anomalous results within the eighteen sub-basins. The average value of tectonic activity indicator (Iat) in the eighteen sub-basins is 2.35 (Tables 2, 4), which indicates Class 3 and means that the tectonic activity is Moderate. Accordingly, the tectonic activity of Kifri Chai Basin is Moderate. The prevalence of the Medium tectonic activity in Kifri Chai Basin (Tables 2, 3, 4, and Fig. 6, Right) is attributed to the following reasons: (1) The exposed rocks within the eighteen sub-basins are mainly clastics, with exception of the Fatha Formation, which includes gypsum and limestone beds with thick claystone beds and thin sandstone beds. Although the Fatha Formation is exposed only in Sub-basins No. 5, 8, 9 and 10 and a very small part in Sub-basin No. 11 (Fig. 2), but the coverage area is very small, along the thrust of Pulkhana anticline only (Fig. 2); therefore, the presence of both rock types does not affect significantly the geomorphological indices as compared to the clastic rocks which cover the majority of the basin, (2) Tectonically, the eighteen sub-basins are located within the Low Folded Zone (Fouad 2012); therefore, have influenced by the same tectonic stresses during the past geological time, (3) The average of the Mountain Front index values is 1.8 (Tables 1, 2), which means Moderate class, but, within Sub-basins No. 3, 5, 8, 9, 12, 13, 15 and 17 is High Class (Table 1). This means in those sub-basins the tectonic activity was higher. Otherwise the Mountain Front index value wouldn’t be High, (4) The eighteen sub-basins are covered mainly by clastic rocks (Sissakian and Fouad 2014, Barwary and Slewa 2014a, b), and are under the same climatic conditions, as the annual rain fall and temperature are concerned; therefore, the shape, size and orders of the valleys are almost the same. Accordingly, the SL, Af, Bs,Hi and Vf values (Table 1) are uniform and exhibit almost the same classes. However, few exceptions occur, especially in Hi and Vf values (Table 2). All the sub-basins have the same class in both indices; Class 3, except Sub-basin No. 11 and 10, respectively which have Class 2 (Table 2). These exceptional values do not influence significantly on the average results of the acquired values. The Af, Bs and Smf indices are distributed over the three main classes of El-Hamdouni et al. (2008) (Table 2).This is attributed to: (1) Locally, hard and massive beds of conglomerate and/or sandstone may influence on the shape of the valleys and their width and depths; accordingly, different results are acquired at different parts in the same sub-basins, (2) The dip amount of the exposed rocks may also influence on the symmetry of the valleys, especially when a valley runs parallel to the main strike of the exposed rocks, the exposed rocks on both sides may have different dip amounts; accordingly, the valley will show different symmetry, and (3) Locally, soft and thick claystone beds, especially in the Bai Hassan Formation will exhibit flat or gently sloping areas within a certain sub-basin; accordingly, the acquired values will differ from the acquired values of other indices. The values of Sl index are also distributed over the classes with the majority being of Class 3 (Table 2), which means Low tectonic activity. This can be attributed to the prevailing of the clastic rocks in the sub-basins; therefore, the grade and rate of the weathering and erosion will be almost the same. Accordingly, the ratio of the valley length to its width will be almost the same; with few exceptions due to the presence of different rock types; rather than the clastics. The Kifri Chai Basin is divided into eighteen sub-basins depending on the 4th, 5th and 6th stream orders to indicate the tectonic activity in the main basin. The tectonic activity is acquired by indicating the six geomorphologic indices that lead to the value of the tectonic activity (Iat). 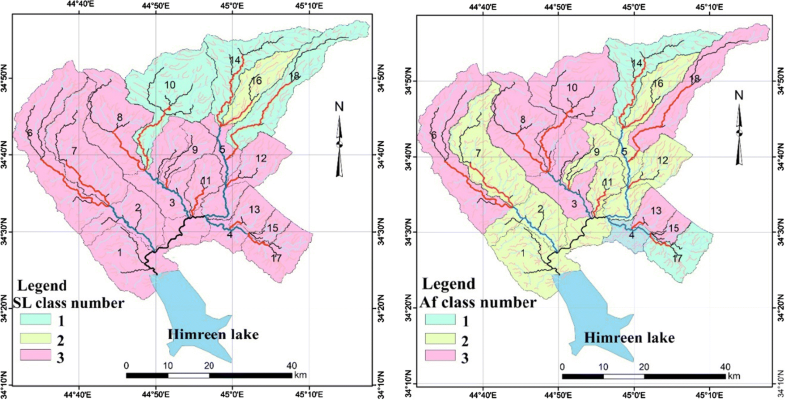 To indicate the values of the six indices, the required data were measured at each sub-basin using ArcGIS technique, the numerical data is acquired from the DEM. The tectonic activity of each sub-basin is indicated; accordingly, the average tectonic activity of the Kifri Chai Basin is indicated. A Moderate tectonic activity is assigned to the Kifri Chai Basin; because the average Iat value is found to be 2.35, which assigns to Class 3 and means Moderate tectonic activity. The regional Neotectonic activity is compared with the relative tectonic activities in the eighteen sub-basins. Generally, there is a fair relation between the two comparatives; especially the subsidence amounts and the scored relative tectonic activity value (Iat), especially, when the range of the subsidence in a certain sub-basin is high. The authors express their sincere thanks to Iraq Geological Survey (GEOSURV, Iraq) for submitting relevant data which were used in the current research work. Moreover, for supplying satellite and images and geological maps. Thanks are extended to Dr. Arsalan O. Al-Jaf (GEOSURV, Iraq) for his critical discussions which amended the manuscript.